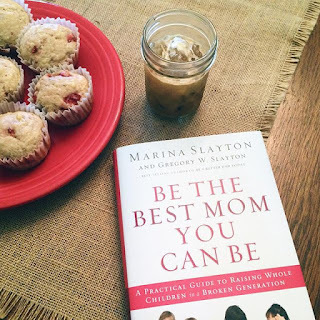 I just finished reading "Be The Best Mom You Can Be" by Marina Slayton, and I can equate it to a "breath of fresh air". So many parenting books seem bent on telling you how to parent, and which type of parenting is best, rather just sharing Biblical truths. I found Slayton's book to be of the later sort, and it was greatly encouraging to my heart. She reminds us that as parents our greatest parenting tool is that of prayer. When you are discouraged or not sure how to approach a situation simply ask for God's direction. She reminds us that our role of parenting is not just a hat to wear, but more importantly it is a ministry. One of the most important ministries that we will ever have. She reminds us that there will be days when we fail as mothers and it's important to accept God's grace and forgiveness when this happens. Doing so provides a model and basis to your children that no matter how many times they fail they too can have grace and forgiveness. She addresses the issues of "synthetic parenting" and getting so caught up in "busy" that we no longer operate as family units. She shares insight on how this is leading to depression, drug usage, etc in our young adults. An eye-opening issue for me, and has reminded me that I need to be more careful with our time as a family. There were many issues that she tackled, but these really stood out to me. If you are looking for encouragement in your role as a mother, I highly recommend this book. Many thanks to Book Look Bloggers for my copy in exchange for my honest review. This sounds like an amazing book. I'm a retired teacher and mom of two college-age kids and she is so right on these points. Thanks for recommending it! You have a beautiful and inspiring blog! I'm a new follower and will share it with my friends. Have a wonderful weekend!